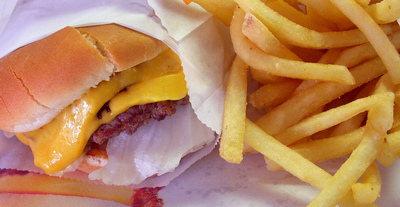 Did you know that the United States has the largest fast food industry in the world? 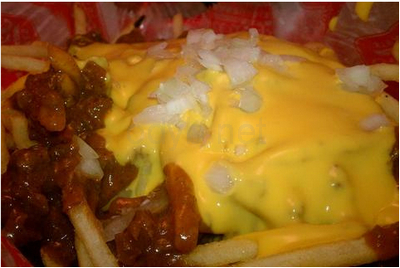 The fast food restaurant chains are so popular because it is easy, filling, convenient and cheap. Almost all kinds of fast food allows you to enjoy your meal without knives, forks and plates. In each state of the USA, there are specific fast food chains well loved among locals, unknown to many. Anyway, below are 58 of the little known fast food chains in America sorted by state in descending order. 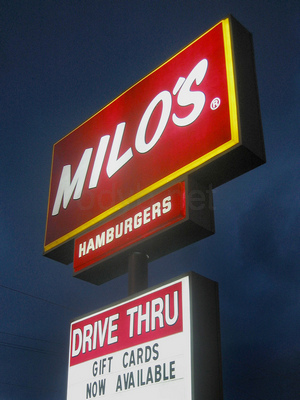 Milo’s Hamburgers is a regional fast-food restaurant chain based in Alabama, United States. As of 2007, Milo’s has 16 restaurants, 14 in the Birmingham metro area, one in Southside, and one in Tuscaloosa. If you live in Alabama, Birmingham, you are probably well acquainted with Milo’s tea. No other sweet tea can ever try to compare to the gold standard that is Milo’s. The burgers are just different. And the best way to eat them is with cheese, pickles, onions and Milo’s sauce. The cheese is melted on the meat, not just placed. The sauce is unlike any sauce you have ever had. It’s essentially a brown gravy, with a hint of mushroom. Milo’s french fries are cut wavy and have another secret ingredient dusted over them. The stuff is good and the salty orange powdery stuff is addictive! 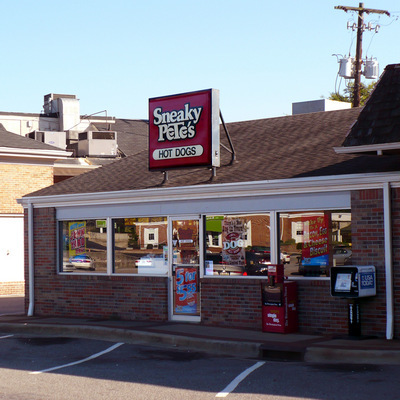 Sneaky Pete’s is a Birmingham, Alabama-based chain of hot-dog restaurants founded by Pete Graphos in 1966 and sold to the present-owner Bernard D’Amico in 1986. Sneaky Pete’s hot dogs are a beef-pork blend with a very thin casing. 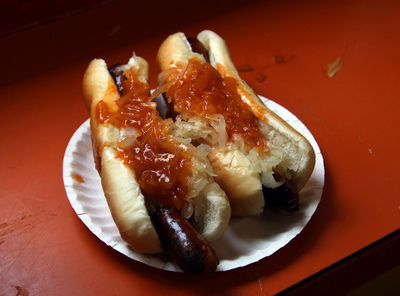 The signature hot dog has mustard, onions, kraut, and the restaurant’s signature hot dog sauce. Other options include chili, cheese sauce, beef sauce, and bacon. 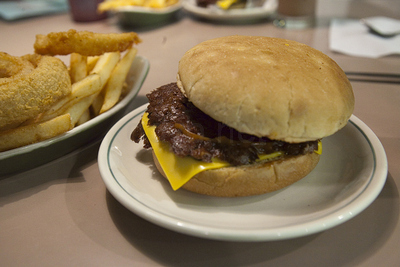 The restaurants also serve hamburgers, french fries, onion rings, nachos, and a full breakfast menu. 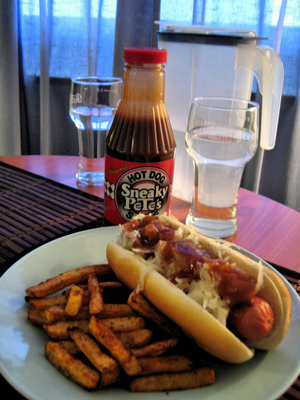 Sneaky Pete’s Hot Dog Sauce is bottled for retail sale and is available at several local grocery stores. A chain of fast food restaurants located in the metropolitan area and region of Southern California, better known as Inland Empire. The Mexican/Hamburger menu is fantastic. The beef tacos are insanely good and greasy. The french fries are a lighter version of Jack In The Box and Burger King. The burger secret sauce is similar to the spread an In-N-Out. The bread they use for the burgers is a tasty whole wheat. 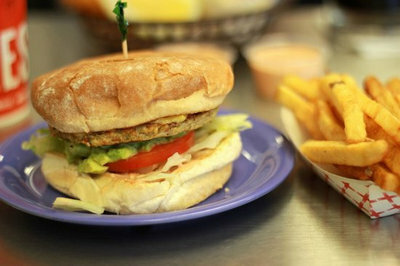 Vegetarians will especially love the Boca Burger as it tastes just as good as a regular hamburger. 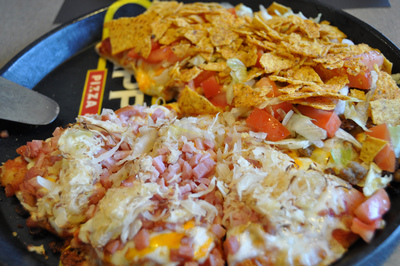 If you love the real thing, the Mama and Papa meals are awesome too. 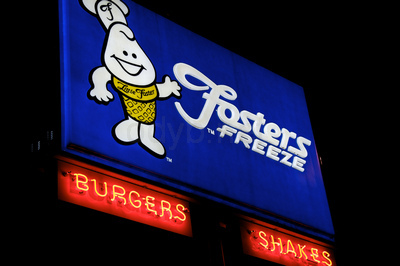 Fosters Freeze (full name Foster’s Old Fashion Freeze) is a chain of fast-food restaurants in California founded by George Foster in 1946 on La Brea Avenue in Inglewood, California, a location that still remains, and claims to have been the first fast-food chain in the state. 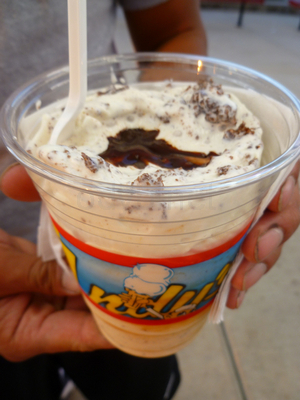 They have old fashioned cones, and banana splits, and sundaes, and smoothies, and root beer floats, milkshakes, and parfaits but fans usually go to Fosters Freese for the twisters! 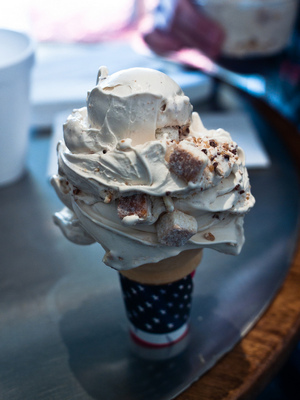 Delicious mixture of candy and cookies mixed into soft serve ice cream. 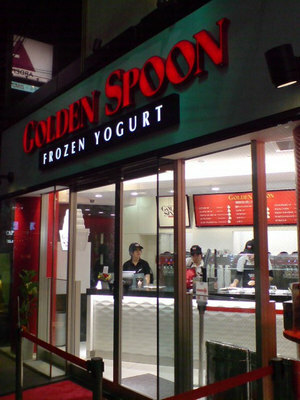 Golden Spoon is a frozen yogurt retail chain headquartered in Rancho Santa Margarita, California with stores located in the western United States, mainly in California, Nevada and Arizona, and international locations in Tokyo, Japan and Metro Manila, Philippines. 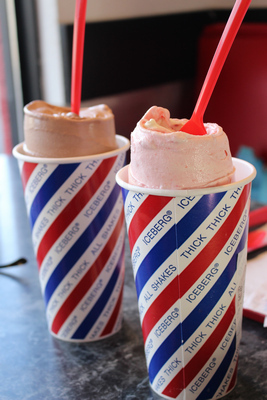 What makes this place great is the 8 or 10 flavors of the day served up soft and whirly like good soft serve should be. They offer lots of different sizes so it’s easy on your budget, even the “mini” for when you just need enough to know you’ve had dessert but don’t need too much that it’s all melty before you finish the last scoop. 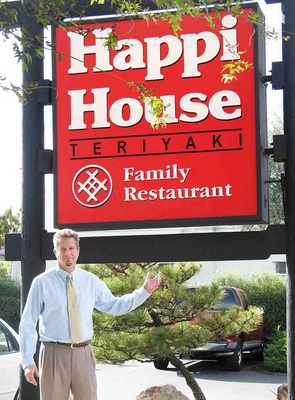 Happi House is a quick service teriyaki restaurant concept established on February 29, 1976, in San Jose’s Japantown neighborhood. Semi-authentic Japanese food. The menu consists of everything drenched in teriyaki sauce. This place is inexpensive and is delicious. All the meals come with a chicken salad and tempura vegetables. 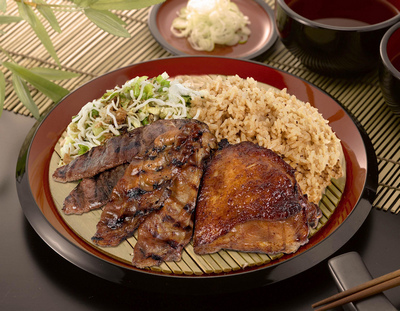 If there isn’t enough teriyaki sauce on the meat for you, just add more! 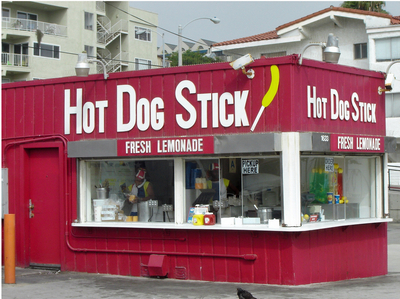 HDOS Enterprises, commonly known as Hot Dog on a Stick, is a fast food company originating in Santa Monica, California that started serving lemonade and hot dog on a stick to people on the beach. The batter is cooked up nice and crisp on the outside and the inside is cornbread heaven. 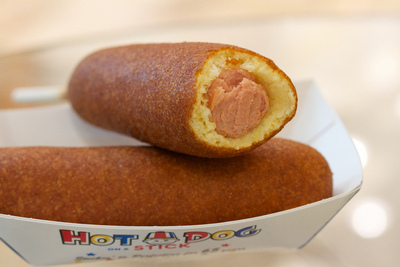 Some prefer the pepper jack cheese on a stick while others prefer the veggie dog on a stick. MOST like both. The fresh lemonade is perfectly tangy-sweet. 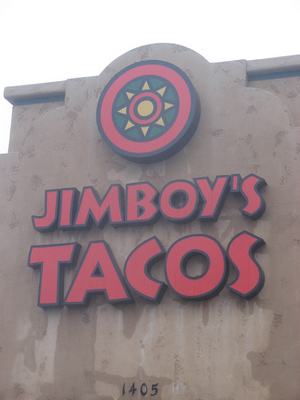 Jimboy’s Tacos is a Sacramento based Mexican style fast food chain, started in 1954 by a couple named Jim and Margaret Knudsen. Famous for their quesadillas which come oozing with gooey delicious cheese, wrapped up in a tortilla, cooked to perfection. Known for Taco Sundays where you will get the cheapest and best tacos in the state of California! 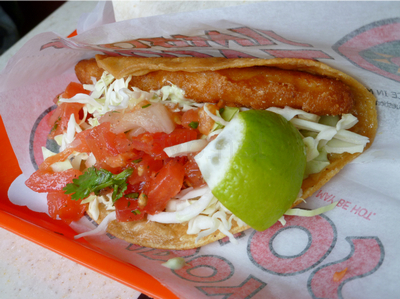 Go for the original taco and get a few of them because you won’t imagine how quickly they disappear! Combo plates come with so much food for a few dollars that you could eat once and probably stay pretty full for the rest of the day. Complete with tortillas, rice, salad, and beans you can order things with it like their tacos or enchiladas, or their combo burrito if you are really hungry! And they serve these with their signature mark of two tortilla chips sitting upright in the beans, as if they are your welcoming committee to a plate full of goodness! Juan Pollo’s rice does not use a red sauce, rather, it seems to use a chicken broth/stock and it was very tasty. The rice is mixed with green onion and bits of shredded chicken. The chicken is moist and flavorful, with a bit of a lemony taste. The potato salad is really, really good. Almost like mashed potatoes with all the usual stuff that goes into potato salads. Sauces at the little salsa bar is consistent and has good flavor. 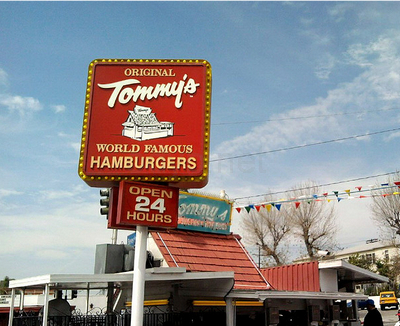 Original Tommy’s World Famous Hamburgers is a hamburger restaurant chain in Southern California known for its chili burgers. 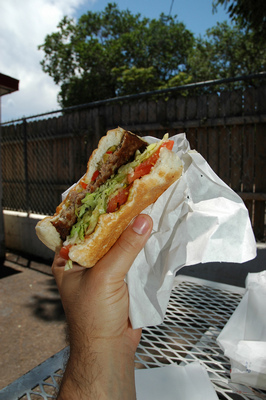 If you live in Southern California and never had a Tommy burger, then you better put it on your short list. Tommy’s chili is very old school. 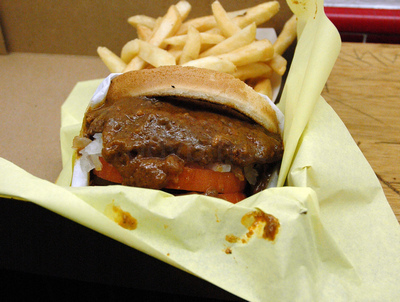 It is a So Cal classic topped with a thick wedge of tomato, chili, and onions. No Thousand Island dressing, no lettuce, no happy meal toy. 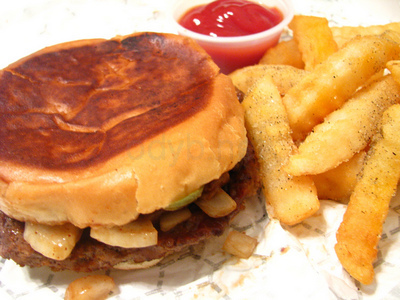 Imagine the intensity and simplicity of texture and flavors – chili, bun, burger, onion, tomato. 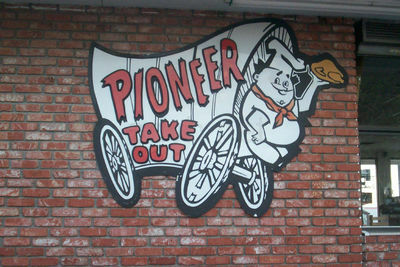 Pioneer Chicken, or Pioneer Take Out as it is officially named, is an American fried chicken restaurant which was founded in the Echo Park area of Los Angeles in 1961 by H.R. Kaufman. There are 3 locations remaining in Los Angeles. 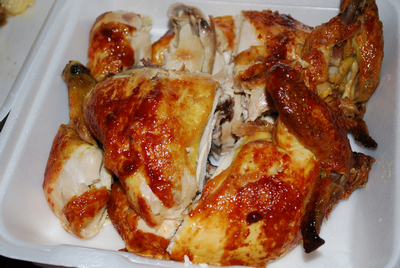 The food is awesome, very crunchy, flavor-filled crust with soft tasty chicken. 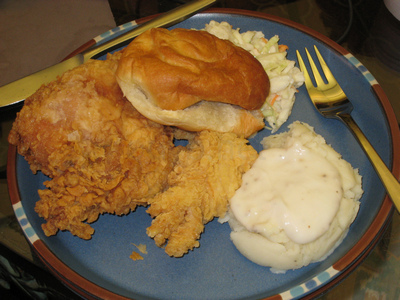 It is down-home chicken, with a little more flavor, more crust, and more grease. 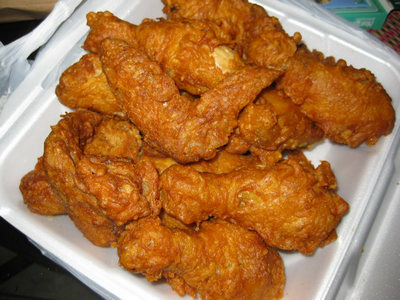 The chicken strips are thick and tasty. They are less greasy and only feature white meat but lots of tasty crust. 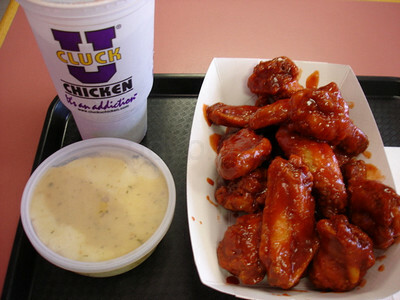 The chicken strips, like the other 3 pioneers left, are thicker and shorter than the ones from the 80’s but very good. 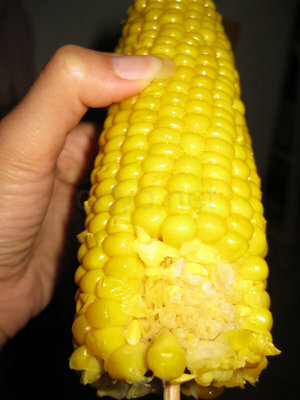 You’ll love love the fries, the corn on the cob is fresh, sweet, juicy and flavor-filled. Oh, and the mash potatoes, cole slaw and mac salad which most people eat less of are grade A. 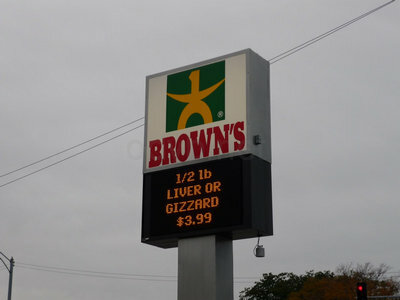 So are the gizzards and desserts. The fries are like McDonalds but thicker, lighter in color and less salty. 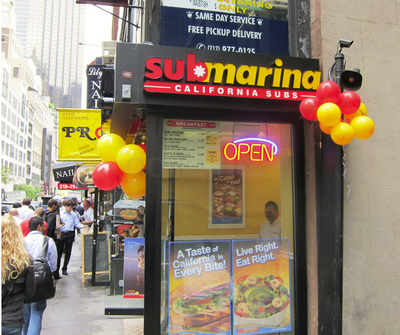 Submarina is an American chain of fast-food restaurants specializing in submarine sandwiches, founded by Ron Vickers and Les Warfield in 1977. Today there are over 50 franchised Submarina locations with the headquarters in San Marcos, California. The sandwiches come in three sizes: 6 inches, 9 inches, and 12 inches and they slice the meat right there in front of you as soon as you order your sandwich. The sandwiches cost more compared to Subway, but you get twice the sandwich so you are a winner either way and the sandwiches are tastier. 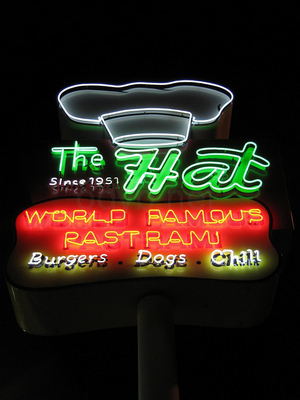 The Hat is a Southern California fast-food restaurant specializing in pastrami sandwiches. 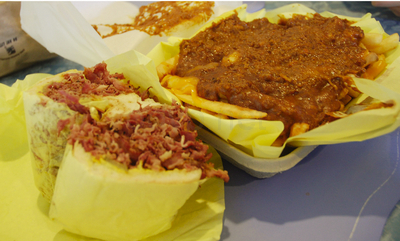 This iconic eatery, once local only to the San Gabriel Valley, has been offering its “World Famous Pastrami” to Southern California residents since 1951. The Pastrami Dip is probably the best pastrami for the price. Freshly made and full of flavor. The portion of pastrami is always very generous. The Gravy Cheese Fries is very good. The gravy is freshly made and poured over fries. It’s very flavorful and won’t be as salty as you’d expect. You might want to share as the portion is really huge! 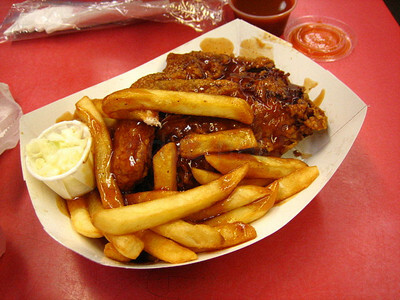 Brown’s Chicken & Pasta, also known simply as Brown’s Chicken, is a chain of fast food restaurants specializing in fried chicken. It is based in the Chicago metropolitan area. What makes it so special is simply quality and taste (more specifically is the buttermilk batter used). They do much more than just fried chicken, from pasta to tons of different Chicago style sandwiches (beefs, sausages, dogs, etc.) and loads of sides to choose from. If you haven’t yet, try the Chicken Parmesan with Mosticolli together with a bowl of flavorful spicy chicken. You’ll love it! 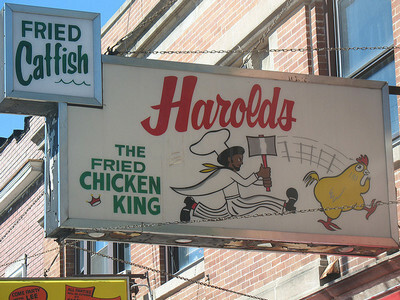 Harold’s Chicken Shack is a chain of fried chicken restaurants located primarily in Chicago, particularly on its South Side. 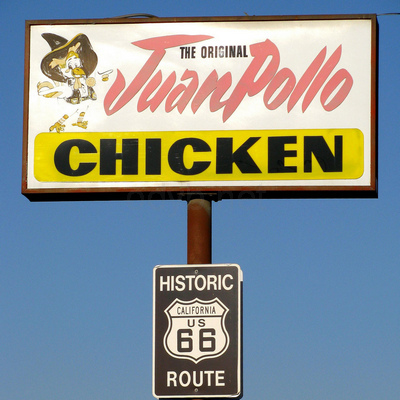 The place to go if you are looking for authentic, vintage fired chicken. Wings are always fried to perfection, and the staff is happy to comply with your request for any combination or all three sauces (bbq, hot sauce and ketchup), otherwise known as everything. The fries are always crispy and delicious, and though they have not yet incorporated a whole grain option for the requisite 2 slices of bread (Wonder white only), everything is nicely separated so you don’t run the risk of the soggy factor where you get fries stuck to bread. The presentation and quality of the fried chicken is well worth the wait. 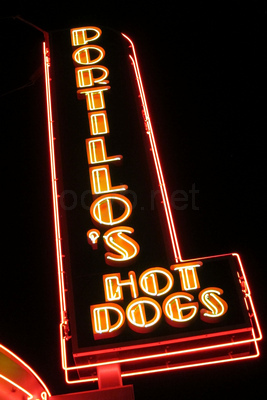 Portillo’s is a chain of restaurants that specialize in serving Chicago-style food located primarily throughout the Chicago metropolitan area, and also has two locations in southern California. Everyone in the Chicagoland area swears by their favorite Italian beef place. The same sentiment goes for pizza and hot dogs. Onion rings are really good too. So are the chopped salads that consists of bacon, chicken, pasta, onions, cheese. Really scrumptious and could easily feed two. Plus you get a bonus lemon poppy seed muffin. 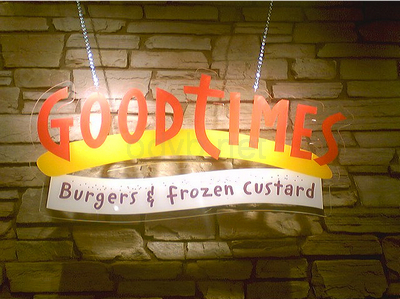 Good Times Burgers & Frozen Custard is a Golden, Colorado-based fast-food restaurant specializing in premium burgers and fresh frozen custard. Not only is their food amazing, and their custard is to die for, their staff is really nice. They will tell you “sorry for your wait,” even if you placed your order just 30 seconds prior. The Burgers are solid. Fries are thick and golden. If you haven’t yet, do try the chicken teriyaki sandwich. Imagine sweet teriyaki sauce with a slice of pineapple nestled between two perfectly toasted buns next to a juicy chicken fillet. That’s the good stuff. 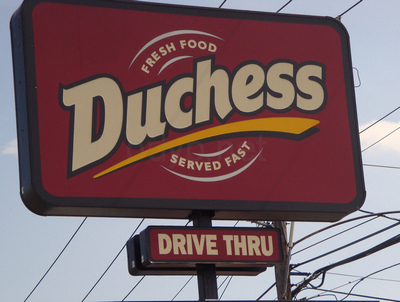 Duchess is a fast-food restaurant chain in southwestern Connecticut founded by Harold and Jack Berkowitz in Bridgeport in 1956. Known for their hamburgers made of Angus (a type of cow). They are so good you won’t need anything else, no fries or soda. So for $5 you get a great meal and get full and satisfied. Duchess comes across to the general public as a real mom and pop hamburger joint where they feel safe to eating without fear of having a chemically made burger from a lab. 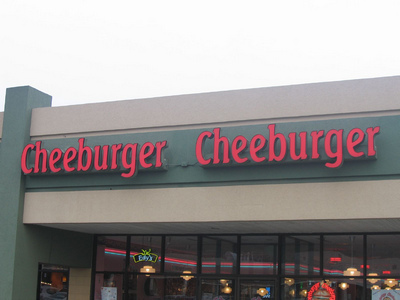 Cheeburger Cheeburger is a 1950s style burger restaurant chain that started on Sanibel Island, Florida, United States, in 1986. 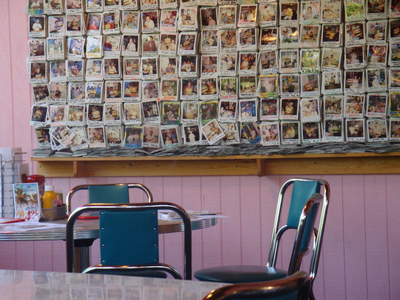 What’s cool about Cheeburger Cheeburger is that you can build the burgers yourself. Pick the size, cheese of choice and the dozens of free toppings! Not only that, you can build your own shakes! There are over 75 flavors to choose from with 378,000 possible combinations. If you finish the entire “Pounder” (20 ounces of beef) burger you get your picture taken with a stuffed fabric “Pounder” and get it hung on the Wall of Fame. 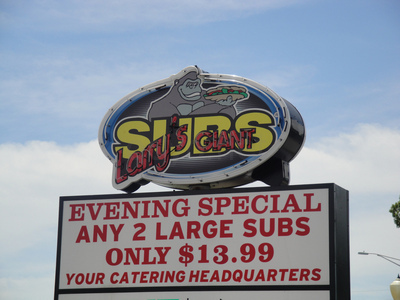 Larry’s Giant Subs is a fast-food submarine sandwich chain that started in Jacksonville, Florida since 1982. 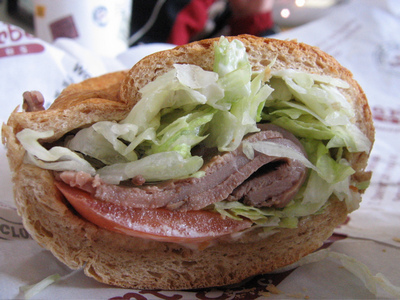 The subs are made fresh, tastes very good and there are many choices. You can even call ahead to avoid a rush. 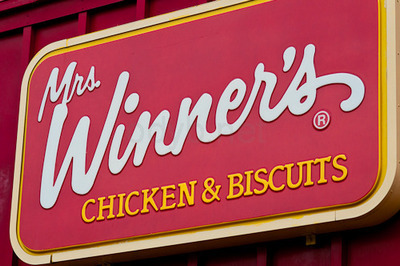 Mrs. Winner’s Chicken and Biscuits is a fast food restaurant in the U.S. Southeast which specializes in fried chicken. 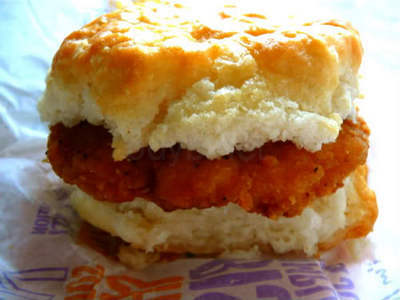 One of the best chicken biscuits you can find in the Southeast. They here are consistently flaky and buttery, and the chicken is big and flavorful and crispy. And, perhaps best of all, available all day long, seven days a week. Need a buttery biscuit at 9pm? You can have it here. In fact, you can have two, as they’re two for $4, which is quite the savings over the regular price of one for $3. 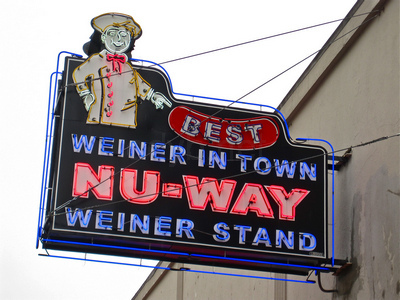 Nu-Way Weiners, Inc. is a company that operates a chain of fast food restaurants that started in Macon, Georgia, USA, known for hot dogs(wieners) that are unique for their red color. Nu-Way has been a staple in downtown Macon for since 1916. They serve one of the best southern style dog. The menu may look cryptic to some but the fellas behind the counter are pretty cordial and patient. For example, “All the Way” means chili, mustard and onions. 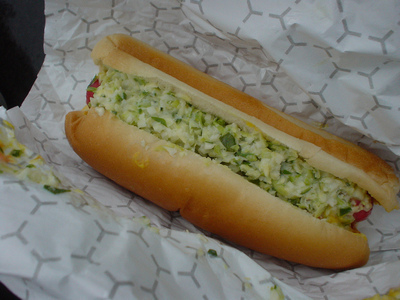 You’d have to try both an “All the Way” dog and a slaw dog. Both perfect in their own way. The chili is also very delicious. One thing cool is that everything is made to order on a flat grill in front of you. 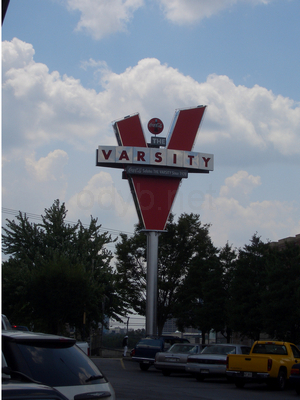 The Varsity is a restaurant chain, iconic in the modern culture of Atlanta, Georgia. The main branch of the chain is the largest drive-in fast food restaurant in the world. The Varsity is an Atlanta landmark with high-calorie, low-nutritional value food that tastes great, costs little, and gets served with a smile. 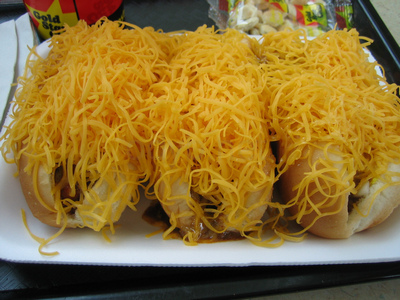 If you like chili dogs remember to add cheese. The onion rings, fresh-cut fries and chocolate or orange creamsicle milkshakes are all delicious. The fried pies are, naturally, Southernly amazing as well. 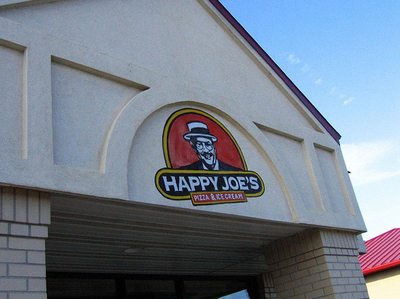 Happy Joe’s Pizza & Ice Cream Parlor is an American pizza parlor chain based in Bettendorf, Iowa founded in 1972 by “Happy Joe” Whitty, a former Shakey’s Pizza manager. Its 61 restaurants are located in the Midwestern United States (in Iowa, Illinois, Missouri, Minnesota, North Dakota and Wisconsin). The place to go for awesome taco pizza, root beer floats, and ice cream. 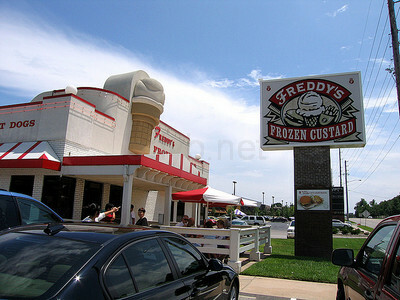 Freddy’s Frozen Custard is a Wichita, Kansas-based restaurant chain, specializing in steakburgers, family recipe chili, Chicago-style hot dogs and frozen custard. This place is a nice break from ordinary fast food joints. Chicken strips are good. 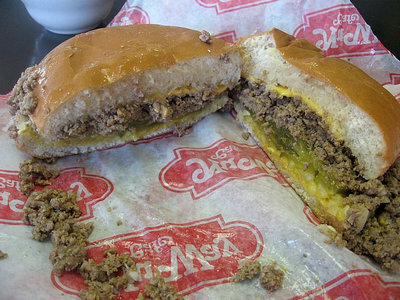 Steakburgers are smashed flat before grilling, giving it a crispier surface. Fries are cut smaller, making it crispier too. 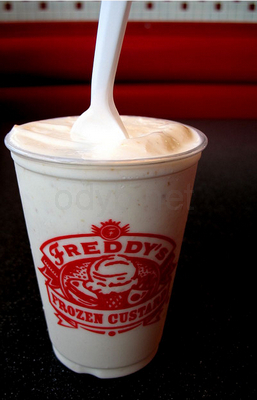 The custard is really creamy and smooth as silk. The creamy texture coating your tongue before it melts completely is just YUM! Both chocolate or vanilla flavors are excellent. 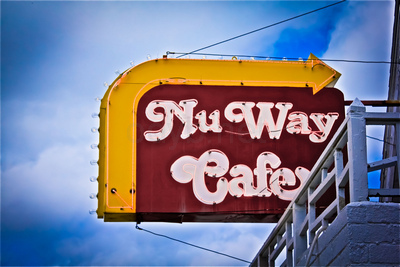 Nu Way is a fast-food restaurant based in Wichita, Kansas. Opening July 4, 1930, the restaurant soon became famous for its loose-meat sandwiches and root beer. 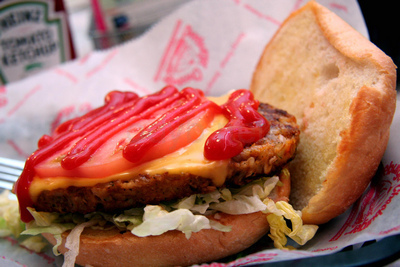 Crumbly is the very loosely-assembled patty that makes a Nu-Way burger, good. The mustard and pickle with the crumbly meat will sort of remind you of White Castle sliders but not a patty. And the root beer and root beer floats are really delicious. So are the onion rings. Great comfort food. 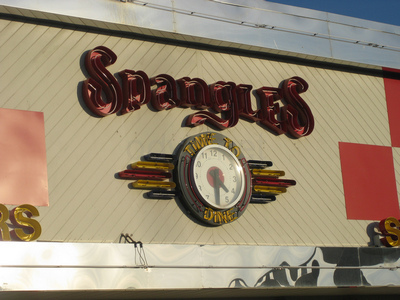 Spangles is a family-owned fast food chain based in Wichita, Kansas. It serves 1/3-pound burgers, flatbread pita wraps, french fries, onion rings, Lactose free milkshakes and other soft-serve ice cream desserts, cinnamon rolls made in Yoder, Kansas and are named after the town, and breakfast sandwiches. 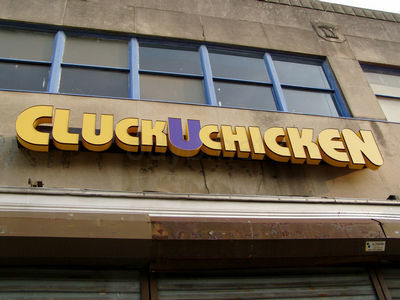 Cluck-U Chicken (also known as “Cluck University”) is a fast food restaurant which specializes in serving chicken. 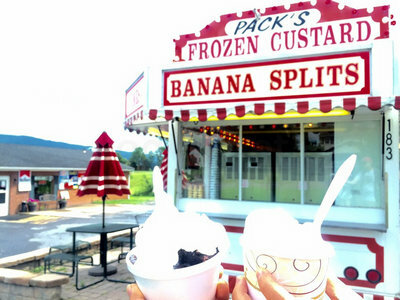 Most of their locations are in the states of Maryland and New Jersey, but there are locations in Pennsylvania as well as one location in Ohio and one international location in Lebanon. The caviar, the truffle of spicy chicken wings. The buttery sauce base is responsible for you feeling the spice sauce in a smooth, silky, lasting flavor. 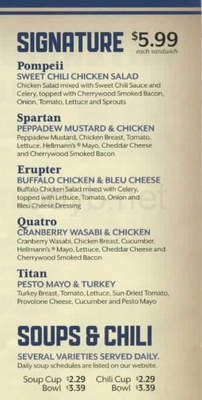 There are a total of 23 different sauce varieties, the most infamous one being the Thermonuclear Death. 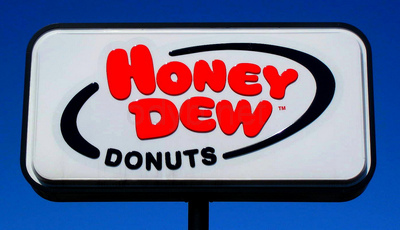 Honey Dew Donuts is a New England doughnut chain. Most of the locations seem to be in Massachusetts and Rhode Island. They are a great option to Dunkin’ as the donuts are more dense and flavorful. The waitstaff is super friendly and has been the same for years. 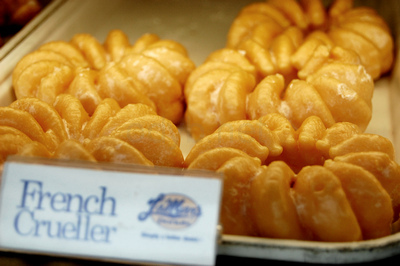 The most irresistible item on the donut menu has got to be The Zachary Donut, the softest honey-dipped donut you can. 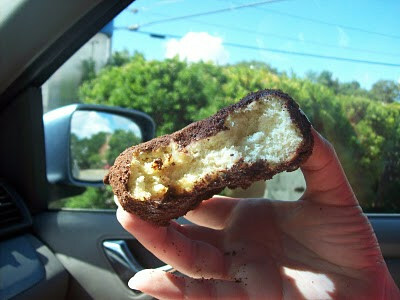 While the donut is still glistening in the honey-dipping nectar, take said donut and put it into a tub of cocoa powder. Immediately serve. 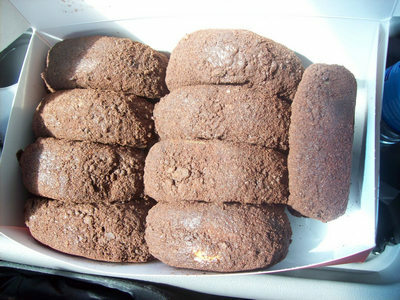 Cocoa powder type stuff is damp and adheres to every single crevice of the donut. Real delicious stuff! 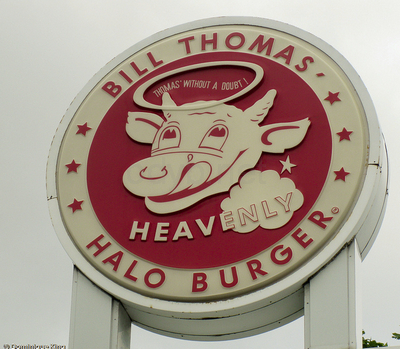 Halo Burger, sometimes known by its full name Bill Thomas’ Halo Burger, is a fast-food restaurant chain based in Flint, Michigan, USA. One of the very few burger joints where you can get heaps of green olives on your burger. 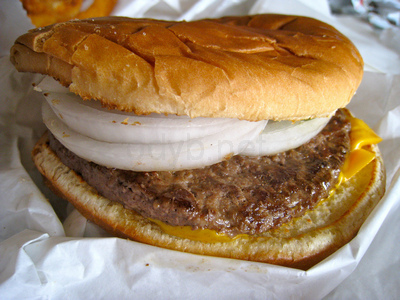 Burger meat comes with no salt on it. Just pure unadulterated goodness. If you get a good cook who really knows what they are doing, that burger will be delivered to you with slight crisp edges. Mind blasting stuff! If you’re a big eater, go for the “Beefy Double Combo” that comes with 4 not too thin, fresh hamburger patties sandwiched between three buns with lettuce, tomato, pickles, onions, ketchup and mustard. Delicious! 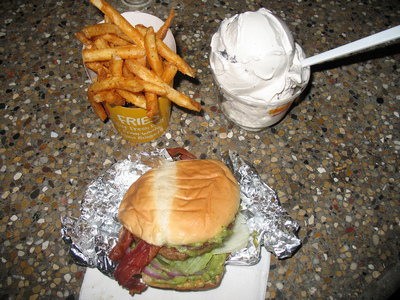 Also, Halo Burger’s special beverage called the Boston Cooler (vanilla ice cream and vernors) is one of it’s kind! As of 2010, Andy’s has more than 15 locations that spans four states; Texas, Arkansas, Missouri, and Illinois. 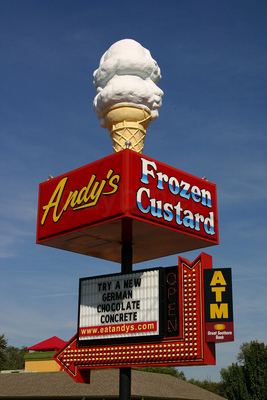 Andy’s was founded by John and Carol Kuntz in 1986 in Osage Beach, Missouri. 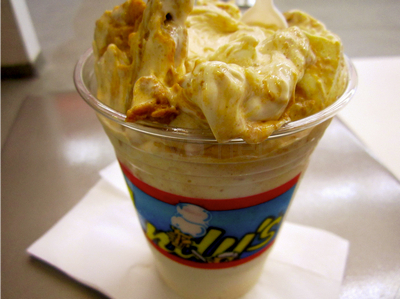 Andy’s is well-known for their pumpkin pie concretes and apple pie concretes in the fall, where slices of pie are blended into the frozen custard. the James Brownie Funky Jackhammer, with peanut butter and brownie chunks blended into the vanilla custard with a hot fudge center. 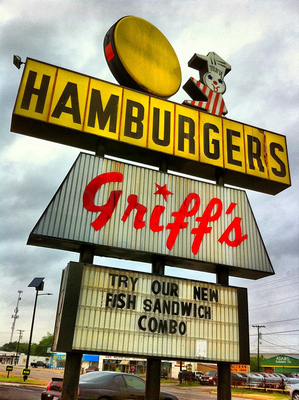 Griff’s Burger Bar is a regional fast food chain founded in the early 1960s by Griff’s of America, Inc. of Kansas City, Missouri, United States. 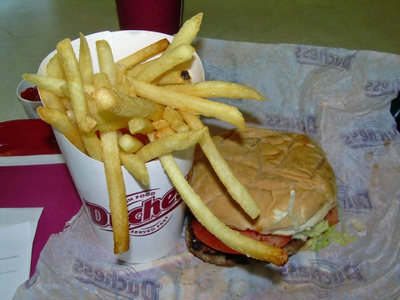 As fast food goes, Griff’s burgers are quite good and they have a fairly large and diverse menu. Burgers are messy, but surprisingly easy to eat. Portions are good, and the meat is cooked well. A variety of premium toppings are available for a little extra, such as jalapenos, mushrooms, or bacon. Burgers do not come with ketchup by default, so be sure to ask for it if you want it. The hotdogs are actually pretty good as well. The Chili Cheese dog looks and tastes like what Hotdog Chili should where actual meat chili is used and the portions are generous. Oh, and it’s topped with real shredded cheese, not cheese sauce. The prices are really very good and easily competitive with the likes of McDonalds and Wendy’s. Though they dont say it on the menu, they do give free drink refills if you ask for it at the counter. 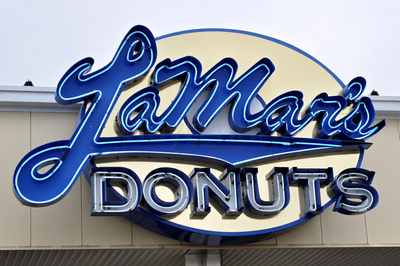 LaMar’s Donuts is a chain of doughnut shops founded in Kansas City, Missouri, and headquartered in Greenwood Village, Colorado. LaMar’s has 28 stores in seven states namely Alabama, Arizona, Colorado, Kansas, Missouri, Nebraska, and Tennessee. LaMar’s are only open until 1 pm and 1 hour before it closes, you get buy one free one donuts. You get 1 free donut for every 6th hole in your punch card. Monday is double punch day. You’ll like the big fat glazed donuts as it melts in your mouth. 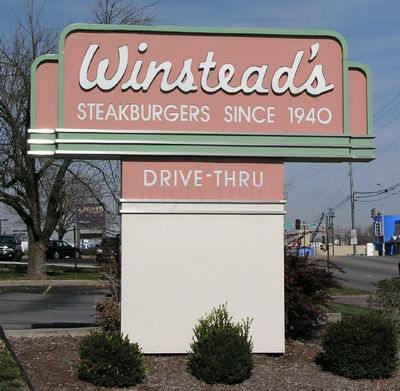 Winstead’s is a hamburger chain based in Kansas City, Missouri, opened in 1940 and currently has 10 locations in Kansas and Missouri. The beef, a top cut, is ground daily on-site and smashed flat while cooking, resulting in a dark brown patty with crispy edges. 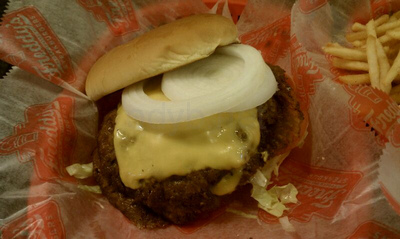 Topped with a sauce that’s a blend of ketchup and mustard, and a huge slab of raw onion, it’s heaven on a toasted bun. And they come served on real plates not paper or styrofoam. Throw in fries, then wash it all down with a cherry limeade that comes with a maraschino cherry and a little scoop of lime sherbet. If there’s still room, order the Skyscraper soda. This chocolate creamy masterpiece serves four. 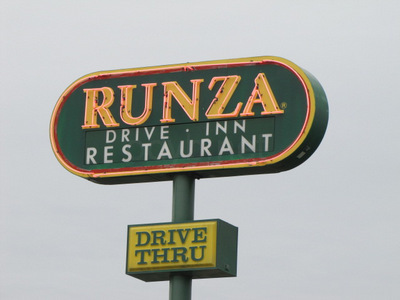 Runza is the name of a regional fast food restaurant chain specializing in ethnic cuisine once served by the Volga German immigrants to the United States. It is simply a cultural and regional phenomenon. 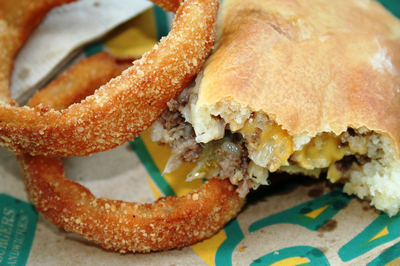 The Runza itself is an old world food coming from places like Russia, Hungary & Germany. That’s what makes it’s appeal so remarkable. It’s something that is seemingly out of place in today’s dining scene yet it thrives in the heart of the Midwest. 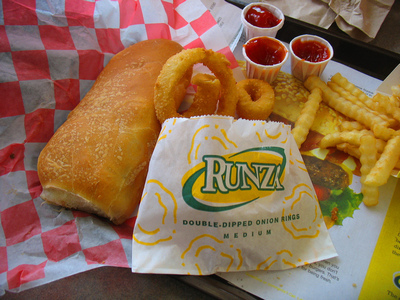 Years back, there was just one kind of Runza. The traditional. Browned ground beef, onions, cabbage, salt & pepper encased in a bun the size of your hand. Down the line Cheese Runzas & Italian Runzas made their way onto the menu, but for the original is where it’s at. It is the perfect meal. As for sides, you can’t go wrong with the fries. Always perfectly crisped & salted they are fantastic. But I prefer the onion rings. Big, crispy & fried to perfection, these bad boys go perfect with a side of French Onion dip. A New Mexico fast food chain based in Albuquerque that consists of over 76 stores as of 2009. 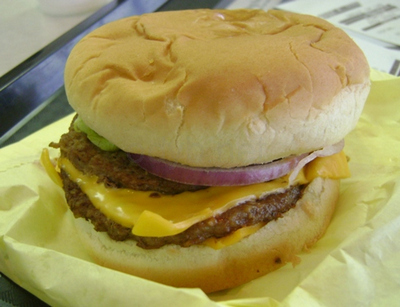 Blake’s Lotaburger also owns the majority of the property that its stores are built on, with the stores being built by the company construction division. Blake’s owns and operates its own sheet metal shop, refrigeration shop, cabinet shop, vehicle shop, maintenance fleet, and commissary. 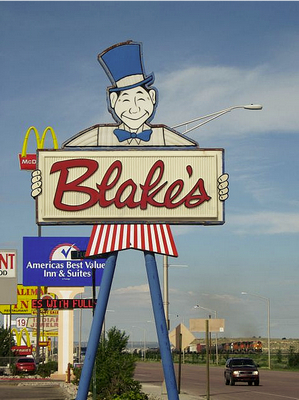 Blake’s signature menu item is the huge and tasty Lotaburger, which is especially popular with cheese and lots of green chile added. 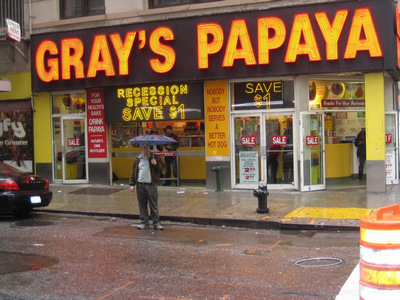 Gray’s Papaya is a hot dog restaurant with two locations on the West Side of Manhattan, open 24 hours a day year-round. The “papaya” in the name refers to the papaya fruit drink sold at the establishment. Meals are as simple as it gets, for as good a price as you can ask for. 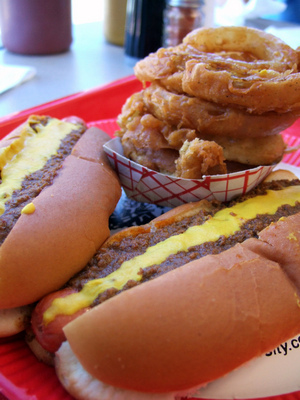 The Recession Special gets you 2 hot dogs and a soda for less than $5! You can’t ask for much more from this NY landmark, and it is definitely worth getting as a quick, cheap, and tasty meal. 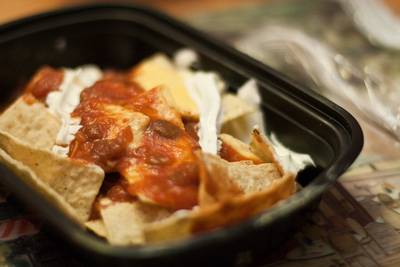 Mighty Taco is a Mexican-style fast-food restaurant chain in the Buffalo, New York area. 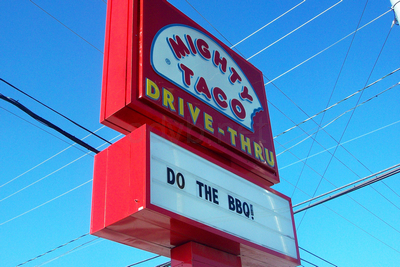 Mighty Taco isn’t really Mexican and Mexican is no substitute for Mighty Taco. Sure the components are the same, but that’s where it ends. If you’re not a local and you find yourself in Buffalo, hungry and want a cheap meal, go to Mighty, get a taco and an empanada, and you must get the ever yummy loganberry. 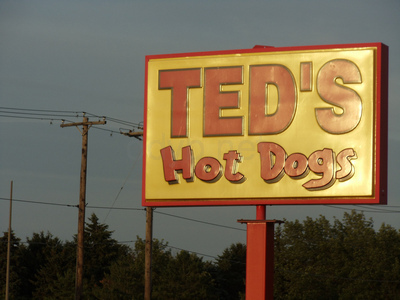 Founded in 1927 by Greek immigrant Theodore Spiro Liaros, Ted’s Hot Dogs is a Western New York tradition based primarily upon their charcoal broiled hot dogs, as well as their homemade secret hot sauce, old-fashioned milk shakes, and handmade onion rings. The dogs here are really, truly flame grilled. It’s hot as hell near those grills and you can see the sparks fly. It gives the dogs a char-burned, crunchy crispy outside and they have a real snap to them more than any other dogs you’ve had, particularly in this area. 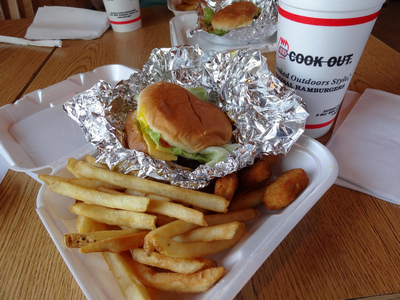 A privately held regional fast-food restaurant chain consisting of 58 locations in the states of North Carolina and Virginia. 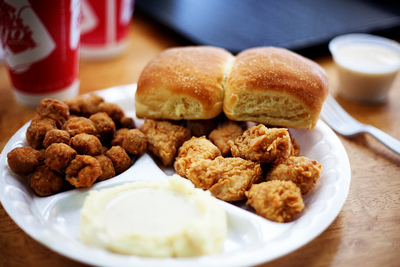 The restaurants specialize in breakfast food and Southern cuisine. 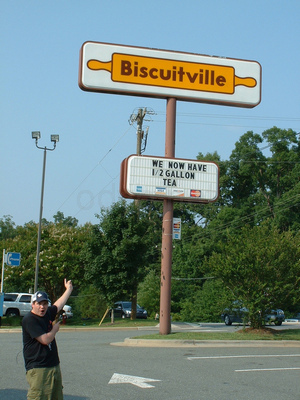 Biscuitville is actually an entire town dedicated to biscuits crammed into a small building with a drive-thru. The biscuits are delicious. 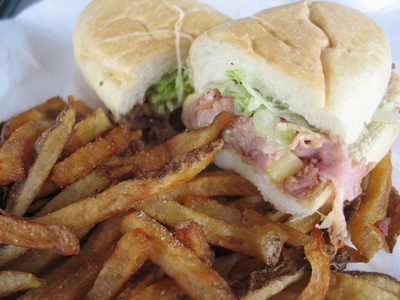 When you get a meal, you can get your sandwich with fries, hash browns, or grits, always nice and crisp. 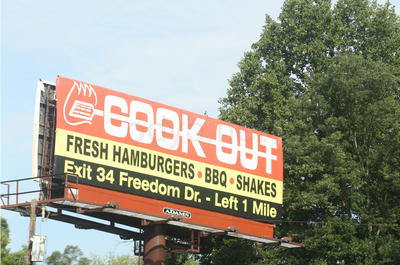 Cook Out is a fast food privately owned restaurant chain in North Carolina, Tennessee, South Carolina, and Virginia. Founded in Greensboro, the chain has since expanded throughout the state and now has drive-thru restaurants in over fifty cities. 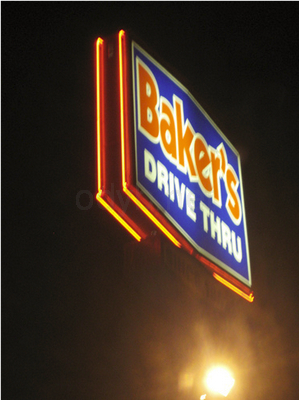 Most locations consist of a double drive-thru and outdoor seating. Specialty items include grilled hamburgers and hotdogs (cook-out style), chicken sandwiches, and North Carolina barbecue. Even the milkshakes are yummy. 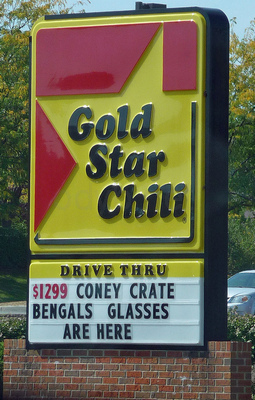 Gold Star Chili is a restaurant chain based in Cincinnati, Ohio, that sells Cincinnati chili. You’ll like the cheese coneys, the chili cheese fries, the 4 ways with onions, the chili cheese dip, and their burritos as well. All delicious! Mr. 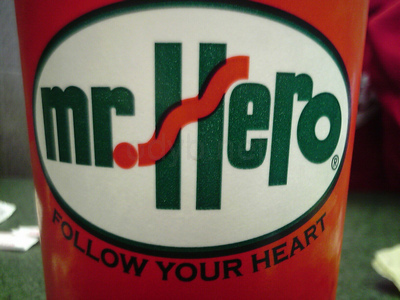 Hero is a restaurant chain selling submarine sandwiches in Northeastern Ohio that began in 1965 when its founder Robert Coulson purchased a Cleveland restaurant and has been expanding ever since. At 860.8 calories and 61.7 grams of fat, Mr. Hero’s most famous sandwich, the RomanBurger, is a garden base setup consisting of lettuce, tomato, and onion with Mr. Hero’s original oil and spices added to it. 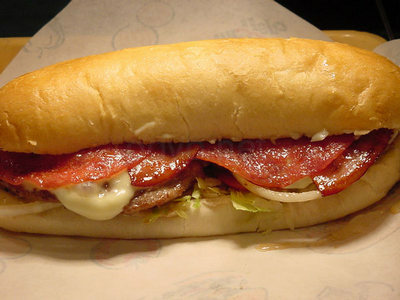 The Roman is then layered with two beef patties, Swiss-American cheese, Grilled Italian lunch meats, and mayo. 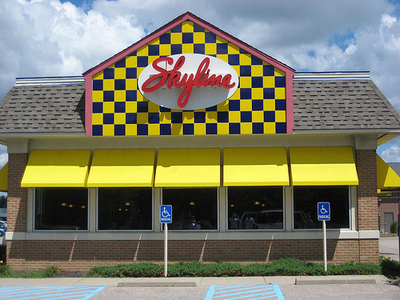 Skyline Chili is a chain of chili restaurants based in Cincinnati, Ohio founded in 1949 by Greek immigrant Nicholas Lambrinides. 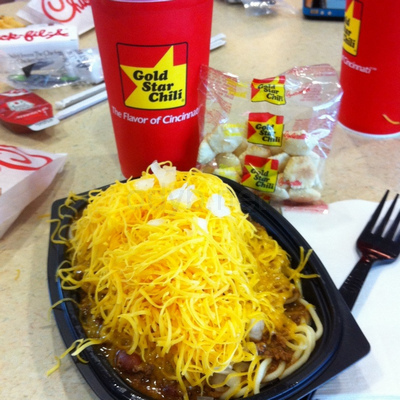 Skyline Chili is unique in that it is not chili con carne. Instead, Cincinnati-style chili is a sauce usually used over spaghetti or hot dogs, containing a unique spice blend that gives it a very distinct taste. 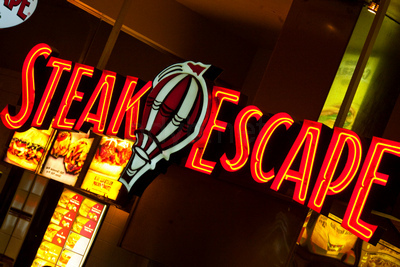 Steak Escape is a restaurant based in Columbus, Ohio. 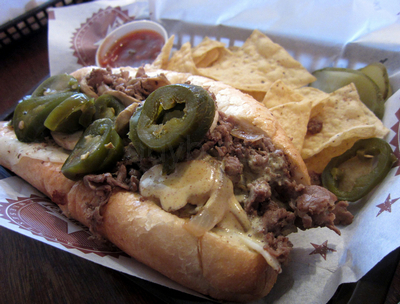 Locations are typically found in food courts in shopping malls as well as airports, all serving a variety of menu items including Cheesesteaks. This place makes a killer buffalo chicken wrap. Fried chicken, cheddar, and straight up Frank’s hot sauce make a great combination. Also, be daring and ask for extra hot sauce. Their fries are always very good too. They have that fresh cut, skin on style that is good, drenched in ketchup. They never seem to skimp on the portions either. Normally, you’ll see cups overflowing with greasy delicious fried potatoes. 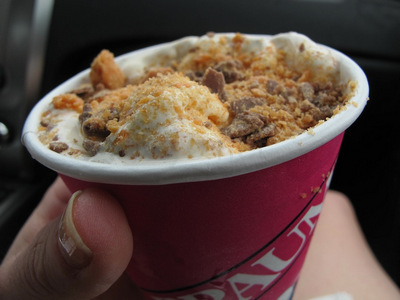 Braum’s Ice Cream and Dairy Stores is a family-owned and operated chain of fast-food restaurants and grocery stores based in Oklahoma City, Oklahoma, with a large concentration on dairy products. In order to maintain the freshness of its products, the company does not open stores outside of a 300-mile (483 km) radius of the home farm in Tuttle. As such, the chain has locations in Oklahoma and those parts of Texas, Kansas, Arkansas, and Missouri within the 300-mile radius. As of 2007, there were approximately 280 stores in operation. 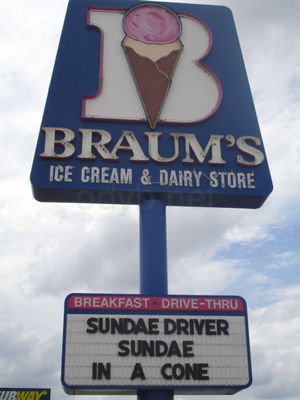 Braum’s owns its own feed mill, dairy herd, dairy processing plant, bakery, stores and delivery trucks. It also owns eight farms and ranches with a total area of 40,000 acres (160 km2), as well as its flagship family dairy farm in Tuttle, Oklahoma. 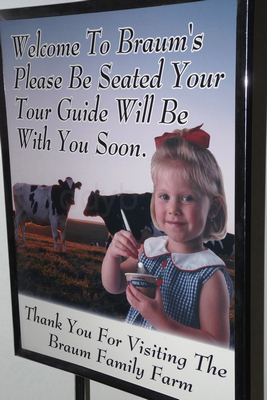 Braum’s describes itself as the only major ice cream maker to still milk its own cows. They also produce the packaging used for their dairy products. Their dessert are wonderful, you wouldn’t expect such great desserts from a fast food place with a little market inside of it. Mix A Mix is a popular item in the menu offering thick, creamy chocolate or vanilla frozen yogurt with any topping that you want mixed in. The hot fudge sundaes are excellent too, being very rich and warm to taste. 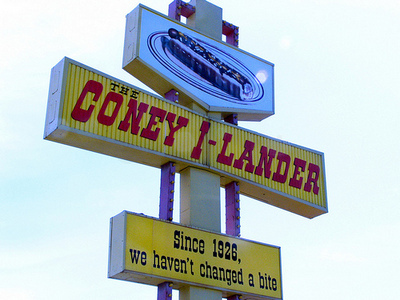 The Coney I-Lander dates to 1926, when Greek immigrant Christ Economou opened his first location in downtown Tulsa. The restaurants survived the Great Depression to become a part of Tulsa’s history. 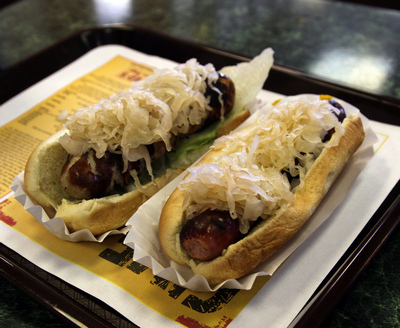 Their signature dish is a slow-grilled hot dog topped with chili, onions, and mustard, sitting in a steamed bun. 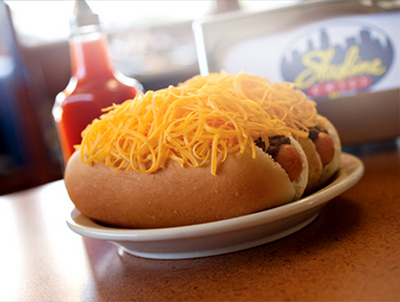 The coneys are unique, being much smaller than a typical hot dog. 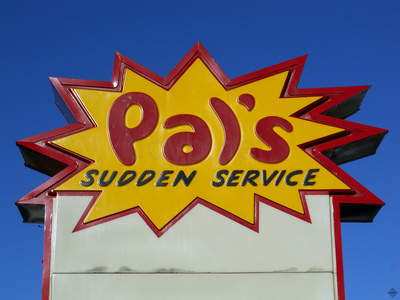 Pal’s at 327 Revere St is the original Pal’s restaurant in downtown Kingsport. It sticks to its roots, as it has no drive-thru, and the tables are located outside under a pavilion. You’ll love this place! People who grew up with Pal’s frequently yearn for a Big Pal with cheese, a large frenchie-fry, and a sweet tea that sticks to your mind. They are also not lying when they say sudden service as you’ll get your order in about a minute. 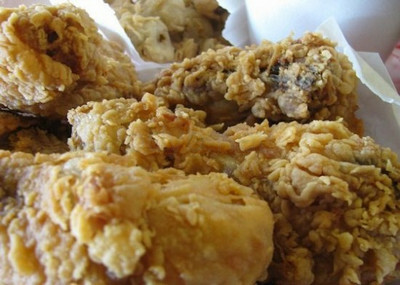 It may not be the cheapest fried chicken in the world, but you will still appreciate the quality of it. And although the prices have risen in the past years, the food is still as good as it ever was. The chicken is magical. Crispy and flavorful batter. Super moist and juicy. You will never feel it’s too greasy, or too dry. The real secret however, is you ask for the packets of spice. It is one of the best spice mix, with a bit of heat and a lot of flavor, you will find. Put a little more on so it stings a bit and you’ll love the pain. Definitely one of the best chicken strips in Texas. 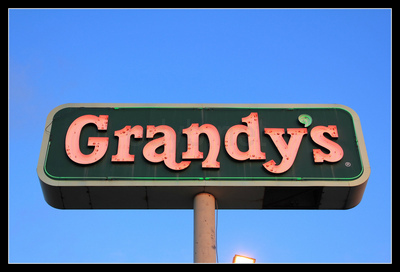 Grandy’s Country Cookin’ is a homestyle cooking and comfort food restaurant chain based in Addison, Texas. It’s like eating at an old farm-town family owned restaurant, but fast. You’ll be blown away by the things you can get here like country fried steak, pot roast, catfish, giblets, chicken, cobblet and cinnamon rolls. The portions are really huge. 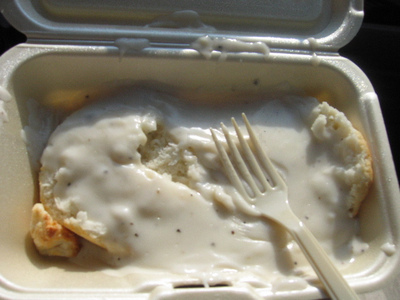 An average human will start feeling full halfway through the chicken fried steak that comes with mashed potatoes and biscuits. 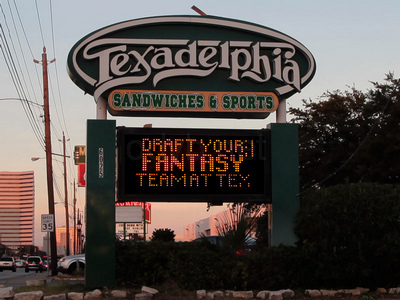 Texadelphia is a chain of more than thirty restaurants specializing in unique cheesesteaks first established on Guadalupe Street near The University of Texas in Austin, Texas in 1985. Texadelphia has excellent tasting angus certified beef, and stuffed with so much of it, you can actually share it with another person. 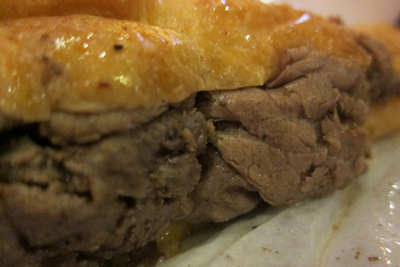 The flavor is perfect, and the bread has texture that pairs well to the beef, not cold and dry like other chains. The bread here is really soft and toasty, and will not break on you. It soaks up some of the beef juices so each bite is so damn flavorful. 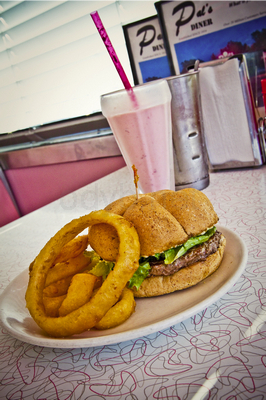 A chain of burger and shake restaurants based in Midvale, Utah. There were 73 restaurants as of February 2011, with about a third owned by the main company and two-thirds by franchisees, in Utah, Idaho, Montana, Nebraska, Nevada, Oregon, Washington, and Wyoming. 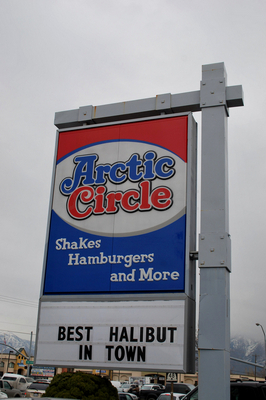 Arctic Circle is famous for inventing the regional condiment called fry sauce which is superbly good with fries. The thing about Arctic Circle burgers, is they have this mysterious white sauce which actually makes them taste pretty good despite the fact that you’re eating a fried burger. 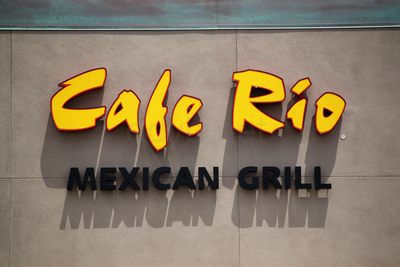 Cafe Rio is a fast casual restaurant chain started in 1997 by Steve and Tricia Stanley in St. George, Utah with branches in Arizona, California, Colorado, Nevada, Maryland, Virginia, and Idaho, serving a variety of Mexican-style food. 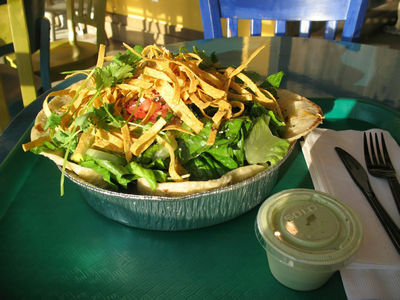 Great Mexican food is served with decent vegan options. Popular items in the menu include veggie salad with Cafe Rio’s own homemade vinaigrette, coconut shrimp tacos with tomatillo dressing and the all time favorite barbacoa pork burrito/salad. 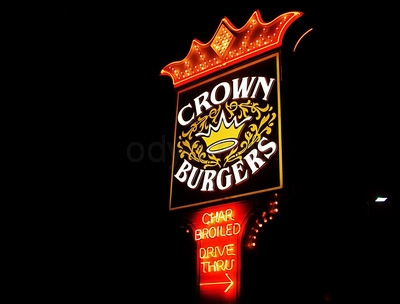 Crown Burgers is a small hamburger fast food restaurant chain based in Salt Lake City, Utah started in 1978 by brothers Nick and Manuel Katsanevas. The burgers are cooked just right. When you eat fast food burgers, you won’t want rare but you also won’t want burnt crisp and Crown Burger knows how to do it just right. They have all kinds of variations from the Crown Burger with pastrami, bacon, avocado, etc. The fries are the perfect size. Not too thick, not too thin. The onion rings are lovely as well though a little greasier. If you visit Utah, this is a must try. Hires Big H is a restaurant chain headquartered in Sandy, Utah founded in 1959 by Don Hale, a former grocer, with the assistance of his wife Shirley Hickman. 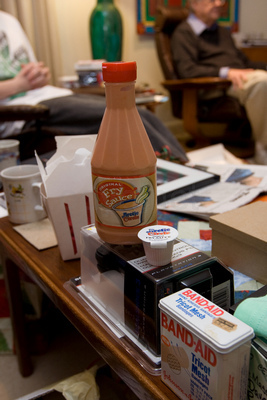 Like many other Utah restaurants, it offers the regional condiment called fry sauce which can also be found in local grocery stores around the state. Stepping into Hires feels like stepping a few years back in time, but the burgers are fabulous. They are also famous for root beers and shakes. Great shakes! Get lots of napkins and either share with someone or get the mini but even the mini is massive. 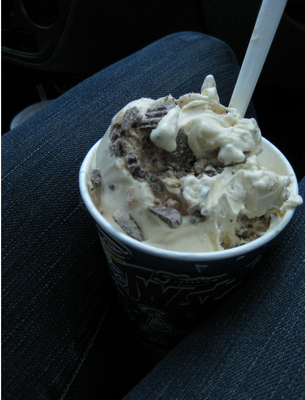 Always more than enough to satisfy an ice cream craving. 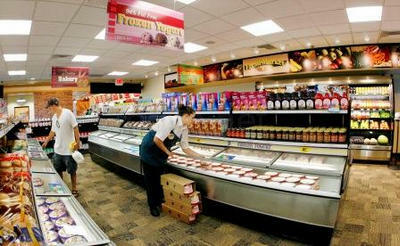 Fantastic and well priced frozen custards. Other items in the menu include ice cream, soft serve ice cream, regular cones, waffle cones, and pretzel cones. 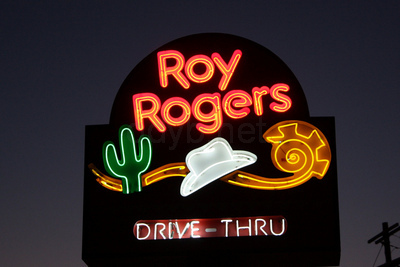 Roy Rogers Restaurants is a Northeastern US chain of fast food restaurants founded by the Marriott Corporation in 1968 in Falls Church, Virginia. As of 2010, Roy Rogers has 47 locations. 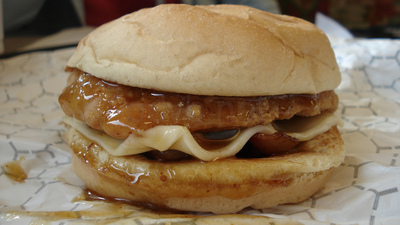 In Roy Rogers, you cannot go wrong with iconic products like the Gold Rush Chicken Sandwich and the Double R Burger. The burger is a real treat. 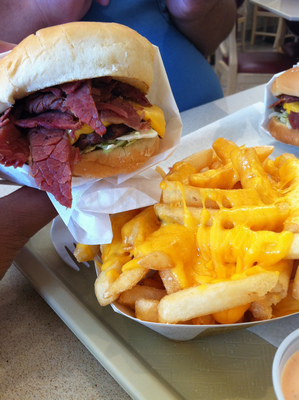 Although the beef is ordinary, the addition of cheese and real shaved ham steak (not deli ham) makes it stand above many other fast food burgers. 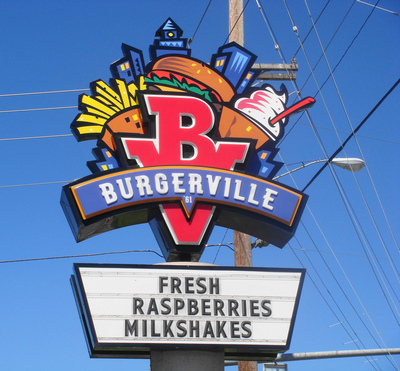 Burgerville is a privately held American restaurant chain in Oregon and southwest Washington, owned by The Holland Inc. All Burgerville locations are within an 80-mile (129km) radius, mostly in the Portland metropolitan area. The chain’s most significant differentiation is in its use of local ingredients and natural ingredients, such as Tillamook Cheddar in its burgers, and locally grown strawberries in its milkshakes and sundaes. Throughout the year it offers seasonal items such as milkshakes made with hazelnuts, fresh pumpkins, fresh raspberries, fresh strawberries, and blackberries, and side orders such as Walla Walla onion rings, sweet potato fries, tempura-style fried asparagus and Yukon Gold potatoes. 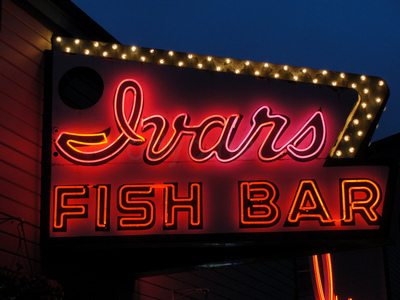 Ivar’s is a seafood restaurant chain based in Seattle, Washington, United States, with operations in the Puget Sound region; in Spokane, Washington; and in Santa Clara, California. 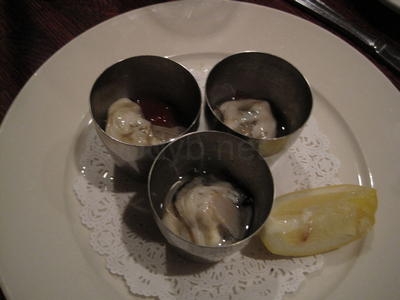 The restaurant has a nice, upscale atmosphere about it and the price and food is absolutely exquisite. Very popular for their happy hours that starts from 3:00 till close even on Saturdays. 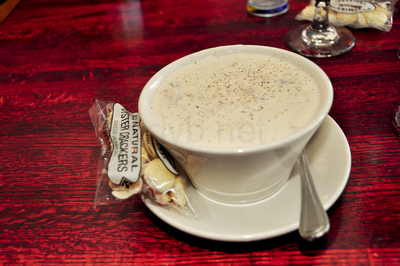 Example, for $4 you can get yourself 6 large, fresh, tasty oysters that come in shot glasses, or a bowl of Ivar’s famous, creamy, delicious clam chowder! 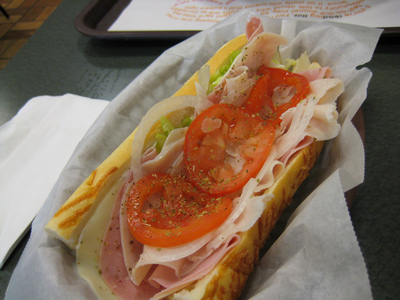 A U.S. sub sandwich chain founded in 1972 in Milwaukee, Wisconsin. 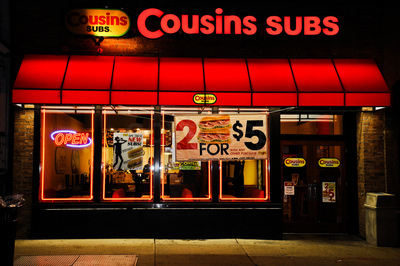 Cousins Subs is a regional chain with stores throughout the Midwest and on the West Coast. 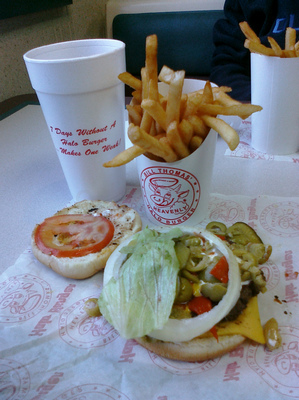 Although the majority of franchises remain in Wisconsin, Cousins restaurants can be found in 6 states, including stores in Arizona, Minnesota and Illinois. 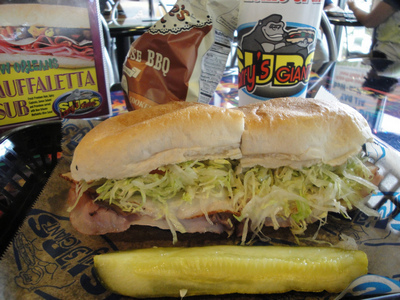 When it comes to subs, you have a lot of choices these days. 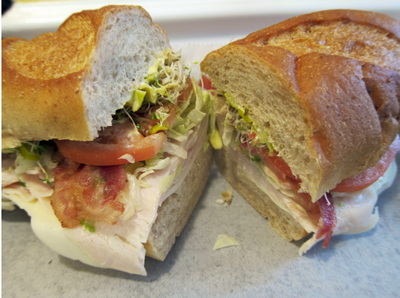 For some, the flavor and ingredients seemed to be quite a bit more tasty than other sub franchises. Try the ham subs, you’ll love it! 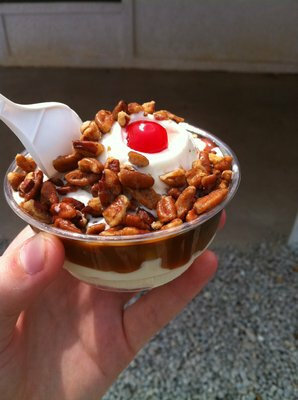 Culver’s Frozen Custard first started in 1984 in Sauk City, Wisconsisn by George Culver along with his wife, son, and daughter-in-law. 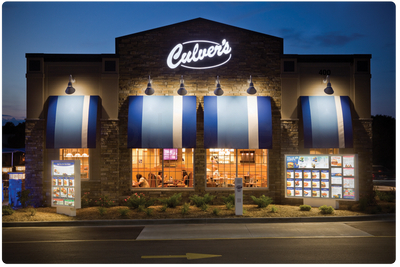 As of November 2014, the chain has 541 restaurants across the United States. 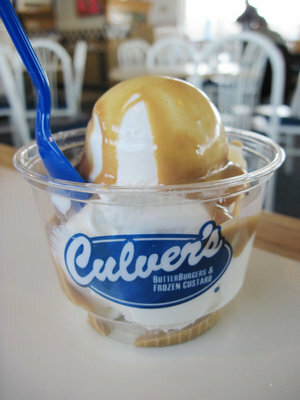 Culver’s menu features Culver’s trademark ButterBurgers and frozen custard, which is also sold in bulk. A specialty is the deep-fried cheese curds. 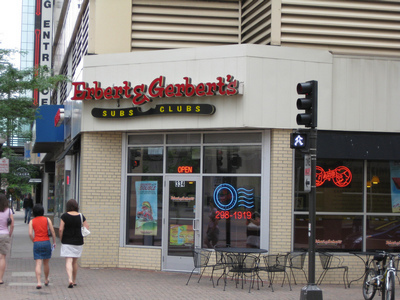 Erbert & Gerbert’s is a restaurant franchise that mainly sells submarine sandwiches. The chain was founded in Eau Claire, Wisconsin in 1987. The company now has 47 locations throughout Colorado, Minnesota, North Dakota, South Dakota and Wisconsin. Inside, it’s your basic sandwich joint. Order at the counter and sit down or take away. Lots of choices on the menu, all with rather strange names. (This is explained on the website). 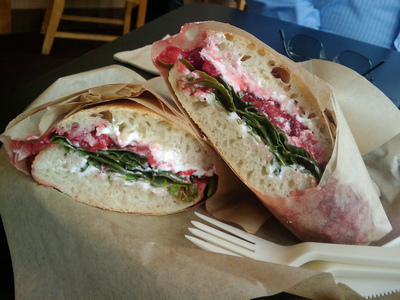 Sandwiches are prepared differently from their competitors as they cut the bread and take out the soft white dough part and leave them on top of the sandwich when done. If they aren’t too busy, the sandwich comes out in a jiffy, just how you ordered it. All the ingredients are fresh and yummy together. You may, however, think it a little strange that they put the bit of bread fluff that they scooped out to make room for the filling right there on top of my sandwich. 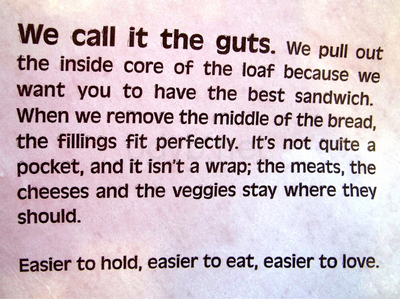 This actually gives you the choice of leaving it aside or to consume it with your sandwich, depending on whether if you are looking to minimize carbs or fill your stomach. 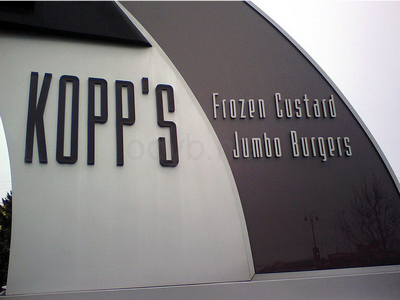 Kopp’s Frozen Custard is a restaurant chain located in the Milwaukee, Wisconsin area that specializes in quality frozen custard and large “jumbo” hamburgers founded by Elsa Kopp in 1950. Their flavor of the day custards are high quality and inventive. One couldn’t imagine ordering the chocolate or vanilla when they have really interesting sounding flavors like French Cappucinno, truffle fudge, red velvet cake, spumoni, etc. 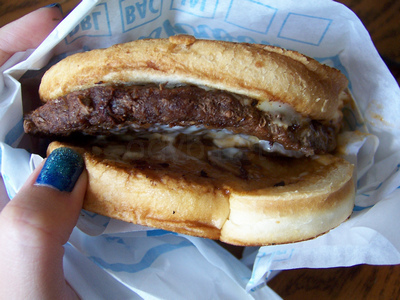 When ordering their delicious jumbo burgers just make sure to get yours with blue cheese and grilled onions. 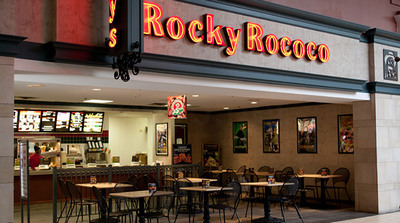 Rocky Rococo is a chain of restaurants headquartered in Madison, Wisconsin, that specializes in pan-style pizza sold by the slice. Wayne Mosley and Roger Brown opened their first store in 1974. If you haven’t, try the deep dish Chicago Pizza. On, and their sauce is awesome! Check out the goofy posters and the swanky nice bathrooms while you’re there. Thanks for the comments cheute! It’s all been added. “Hires Big H Drive-in” located in Salt Lake City, Ut is the best. It’s been around since the 50’s serving great burgers on homemade buns, unbelievably good homemade root beer, shakes and fresh cut french fries. I started going there in the 70’s when I would visit from Wyoming. The owner and founder of the restaurant Mr. Hale would greet you at the door and seat you at a table. I was there again this summer for the first time in several years to find that Mr. Hale had died a couple of years ago, but the food and service are still excellent. Yeap, it’s an old school restaurant. Thanks for the suggestion. It’s now included in Utah. 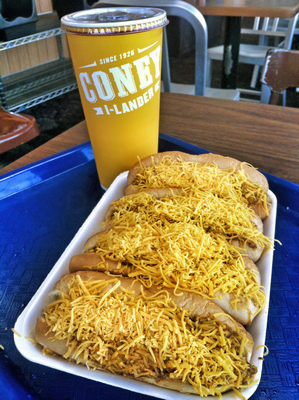 You didn’t mention Coney I-Lander in Oklahoma. A staple if you were born and raised! It’s now mentioned. Thanks for the input, Heather! 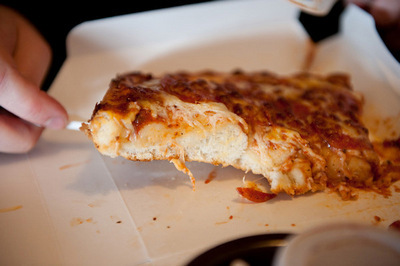 Wisconsin- what about Rocky Rococco’s pizza? This is the only non-Chicago based pizza place that a Chicagoan would go to. 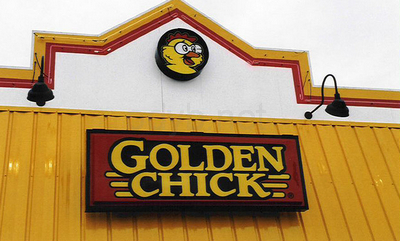 There are now 5 fast food chain in Wisconsin thanks to you. How about “Dog n Suds” – headquartered in Champaign, Illinois? This chain once had 600 locations but poor business decisions by new owners forced most of them to close. A few of the older drive-in locations remain open and are well worth seeking out. In the late ’60’s, their “Texas Burger” was fantastic! How about Marlins Family Restaurants with 8 locations in SD and ND. Got to love the belly buster breakfast. What about Steak ‘N Shake? It is really famous in Missouri. Next Next post: Types Of Makeup You Should Know About. Here’s A List Of 29 Items!